Jesus went on ahead, going up to Jerusalem. Now when he was near Bethphage and Bethany, close by the Mount of Olives as it is called, he sent two of the disciples, telling them, ‘Go off to the village opposite, and as you enter it you will find a tethered colt that no one has yet ridden. Untie it and bring it here. If anyone asks you, “Why are you untying it?” you are to say this, “The Master needs it”.’ The messengers went off and found everything just as he had told them. As they were untying the colt, its owner said, ‘Why are you untying that colt?’ and they answered, ‘The Master needs it’. ‘Blessings on the King who comes, in the name of the Lord! Some Pharisees in the crowd said to him, ‘Master, check your disciples’, but he answered, ‘I tell you, if these keep silence the stones will cry out’. passion, cross and death await him. He faces all this with complete willingness, knowing that in this way the Father’s eternal plan will be fulfilled in him. 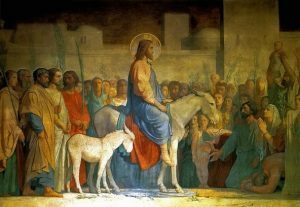 Since that day, the Church throughout the world has repeated the words of the crowd in Jerusalem: “Blessed is he who comes in the name of the Lord”. She repeats it every day while celebrating the Eucharist, shortly before the consecration. She repeats it with particular emphasis today, Palm Sunday. the Eucharist to meet us in a new way. We greet with the cry of “Hosanna!” the One who brought God’s glory to the earth in flesh and blood. We greet the One who came yet always remains, the One who is to come. We greet the One who, in the Eucharist, always comes to us again in the name of the Lord, thus joining the ends of the earth in God’s peace. Pope Emeritus Benedict XVI, World Youth Day 2006. HOLY WEEK SCHEDULE There is no celebration of any sacraments from Thursday Mass of the Last Supper until the Easter vigil. Maundy Thursday Mass at 8pm (no 9am Mass). Polis at 6pm. Good Friday Service at 3pm in AK and Polis. Holy Saturday Easter Vigil Mass at 8pm. Polis at 7pm. DONATIONS FOR EASTER FLOWERS We raised €330 for the Easter Flowers. Thanks for your help. DEEPEN YOUR FAITH Join our discussions on Scripture, Church teaching, art and more. Tues 4 – 5:30 pm, in Tala. Call Irene Meerman 99 796040. COACH TRIP TO KYRENIA Wed 22 May. €25 to help Hospice. Bring passport. Sponsored by Blevins Franks. For info call Linda 99562387. CARITAS PAPHOS You can help with non-perishable food for poor families. Thank you for your prayers and donations.